UNITED STAFFING REGISTRY, INC., d/b/a UNITED HOME CARE, licensed by the State of New York Department of Health, is a proud recipient of the “CORPORATE BENEFACTOR OF THE YEAR” award given by FRIENDS INDEED, USA, INC., for “its devoted dedication to their fellow citizens and exceptional generosity,” in a ceremony held at Astoria World Manor last June 23, 2007. Since it inception in 1988, helping the cause of the Filipinos and Filipino-Americans is second nature to UNITED STAFFING REGISTRY d/b/a UNITED HOME CARE having been repeatedly involved in several humanitarian causes and projects. 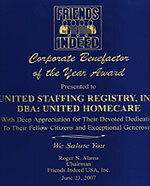 From its humble beginnings of a couple of employees and a handful of nurses, UNITED STAFFING REGISTRY, INC., d/b/a UNITED HOME CARE has grown by leaps and bounds to the present office force of more than 300 members of the staff, office employees, nurses and health care givers in its employ. Records will show that the company has, thru its Human Resources, petitioned thousand of nurses and health care givers, majority of whom have joined the mainstream as American Citizens and occupying executive positions in various hospitals and health care facilities throughout the country. UNITED HOME CARE, the mother company in New York covers the following subsidiaries; United Staffing Registry, a staffing, placement and recruitment covering the United States; United Home Care, Inc., a licensed home care agency in the State of New York, United Home Care Foundation of Queens, the charity arm of United Staffing Registry, Inc.; United Travel World Agency, United Animations, Inc., and United Staffing Registry of New Jersey, LLC that offers courses in Hemodialysis and BLS. Two (2) other companies in the Philippines are the United Home Care Foundation Institute of Allied Health Profession (School of Nursing) located at No. 4 Gumamela Street, Pembo, Makati City, Philippines and the Panther Security Agency, Inc. at No. 25 Lot 9, Sampaguita Street, Pembo, Makati City, Philippines.